Doodling in class isn't what the teacher usually wants. But for a group of medical students in Chicago, it is exactly what they should be doing. The crayons are there to help them become well-rounded doctors - by drawing cartoons. The idea is that drawing the images, complete with speech bubbles, helps future doctors think about how they relate to patients in what they say, but also through body language. 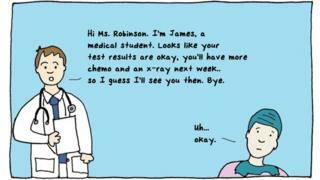 In the cartoon strip commissioned especially for this article, the graphic artist and former HIV/Aids nurse MK Czerwiec explores how a doctor's brisk and breezy attitude towards a cancer patient makes her feel like "just another lab result". 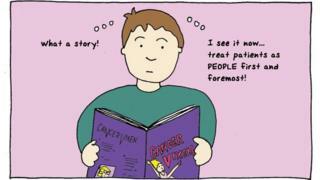 I am interested in the narrative of medicine - the way doctors and patients think of illnesses in terms of stories. 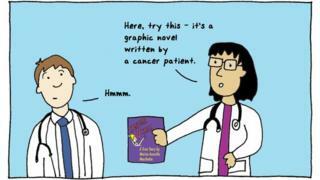 Only when an enlightened colleague offers the doctor a graphic novel written by a cancer patient does he start to see his own patient as a person, first and foremost. Aspiring doctors know that to get to the top they will have to retain vast quantities of information. But MK - now known as the Comic Nurse - has also added drawing cartoons to the curriculum at the Feinberg School of Medicine at Northwestern University in Chicago, where she teaches. It all began when she was dealing with a particularly emotionally draining job. "One day, just not knowing what else to do, I drew a picture of myself and then I put a few words above it. "I drew a box around it, and then I drew another box. Before I knew it, I went from a state of really struggling with a patient's death to finding myself nine boxes later in a place of hope. And that really surprised me." 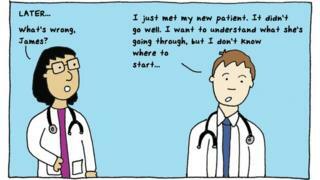 Alexandra Jones is one of the Chicago medical students trying out the comic strip idea. She said drawing a sickbed scene helped her understand the dynamics of a consultation from the patient's point of view. "It allows a good outlet for humour and kind of self-expression at times when it could seem insensitive or difficult to express otherwise." It's still too early to assess the full impact of comics on clinical outcomes. But Dr Ian Williams - a British comic artist, physician and joint editor of the Graphic Medicine website is confident that they have a role to play. "We know the rules and format of comic strips because we all read them as children. "They are read panel-by-panel - but we can also flip a few panels ahead and refer back, like fast-forwarding or rewinding a DVD." Williams went to art school after training as a doctor and says he has always had a passion for drawing. "When I was in medical school I used to draw to understand anatomy. These were the 'pre-internet' days! So if it wasn't in a book I'd draw slices of the brain, or the circulation of the heart. "It would "fix" it in my brain." His own graphic novel, "The Bad Doctor", will be published next year. "I am interested in the narrative of medicine - the way doctors and patients think of illnesses in terms of stories, and what it says about how we have thought about illness through history." 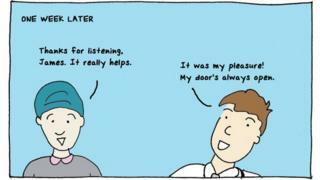 Seeing things from the patient's point of view is vital. Those who've lived through an illness themselves - or their relatives - have also created graphic accounts of their experiences. Brian Fies is a writer and illustrator. It seemed natural to him to turn to writing and drawing when his mother developed lung cancer, "Mom's Cancer", was first published as a web comic, and later as a book. "I wanted to share my family's experience somehow; to draw a map for anyone coming after us, but didn't know how until I accompanied my mother to chemotherapy one day and drew a sketch of her in the chair. "That one picture captured more about that day than a thousand words could have, and I thought comics could be my medium." If comics are to be included in medical training then their impact needs to be backed up by evidence. Giskin Day, who runs workshops on the value of the arts to trainee doctors at Imperial College London, believes that comics could help with one thing everyone is short of: time. "Graphic novels don't take long to read but they are incredibly good at making a powerful impact." She urges her students to get creative. "If they draw a few panels illustrating a consultation, they think about other aspects of the clinical encounter, such as the doctor's posture, the patient's body language or the arrangement of the consulting room." For the MK Czerwiec, witnessing difficult experiences, when doctors and nurses were not tuned in to patients had a profound effect. Drawing comics helps to improve that bond. "Illness doesn't just happen to a body. "It happens to a person, a full life, a family and the care that's provided needs to be contextualised into that story of that life and that family and then the care can be more relevant and helpful." 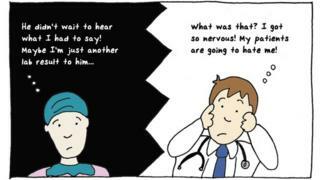 Graphic Medicine Exploring the interaction between the medium of comics and the discourse of healthcare.